Our wise and generous Mordecai Shelf Sitter Gnome sits on your garden wall, front porch step or bookshelf and clasps his hands together, praying for all good things to come your way. The wonderful detail in his face and flowing clothing, the kind look in his eyes and his rosy cheeks will warm your heart. As one of our sitting gnomes, Mordecai creates a loving atmosphere in whatever room or outdoor space he graces. 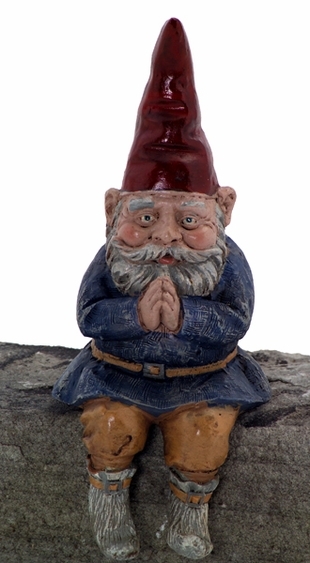 This 13-inch Mordecai gnome is the perfect size for a charming accent for your decor. Our gnome shelf sitters make unique and thoughtful gifts, too. We offer other garden shelf sitters such as Grimmbel, Zelda, Rumple and Merlin. At GardenFun, we carry all sorts of lovable garden gnomes to turn your yard into a memorable, magical place.